Green Lantern (2011) is a superhero movie based on the Green Lantern character by DC Comics. Synopsis from IMDb: For centuries, the emerald energy of willpower has been fueling intergalactic peacekeepers known as Green Lanterns. Thousands of specially chosen warriors and guardians police the galaxies, using their unimaginable powers to quell the evil forces of fear. Legendary legionnaire Abin Sur (Temuera Morrison), aglow with purplish, translucent skin and rubbery tendons, discovers that an ancient monstrosity called Parallax has been steadily growing and is responsible for the recent deaths of several highly skilled Green Lanterns. When he encounters the frightful anomaly firsthand, he's mortally wounded and must crash land on Earth. The viridian energy works in mysterious ways, and purposefully chooses the individuals that harness its powers. When Abin dies, the ring he possesses, recharged by a literal chartreuse lantern, seeks out devil-may-care, foolhardy, hotheaded jet pilot Hal Jordan (Ryan Reynolds) to be its new caretaker. 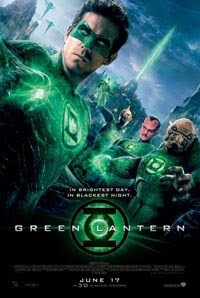 At first he has no interest in assuming the responsibilities of protecting a massive sector of civilization, but with the help of negativistic ally Sinestro (Mark Strong), bulky alien Kilowog (Michael Clarke Duncan) and bird-beaked mentor Tomar-Re (Geoffrey Rush), Hal will become the most powerful Lantern of them all. I'm not a comics fan and so, I've trouble differentiating DC Comics from Marvel Comics characters. Even worse, I thought Green Lantern is related to The Green Hornet. Such an ugly joke, huh? Anyway, I did a little research and I really like this introduction by Tomar-Re in the Green Lantern movie: "Billions of years ago, a group of immortals harnessed the most powerful force in existence: the emerald energy of willpower. These immortals, the guardians of the universe, built a world from where they could watch over all of existence: the planet Oa. A ring powered by the energy of will was sent to every sector of the universe to select or recruit. In order to be chosen by the ring, one had to be without fear. Together these recruits formed the intergalactic peacekeepers known as the Green Lantern Corps. The greatest threat the Corps ever faced was Parallax, an entity that fed on the yellow energy of fear." Honestly, I'm pleasantly surprised by this movie. At first, with my limited knowledge about the lanterns, I'm quite skeptical about Ryan Reynolds as the Green Lantern but hey, he's refreshingly likeable! The Green Lantern is a superhero but NOT the formidable and fearless kind. In fact, he's scared and he runs away from shouldering responsibilities until he realizes he's meant to be part of the Green Lantern Corps. The rest of the cast is considerably good too. Blake Lively as Carol Ferris, Hal's love interest, is gorgeous and feisty at the same time. Onscreen chemistry between the two of them is sweet, pleasant, and lovely. I really love Carol's supportive attitude when Hal is demotivated and scared to carry out his new responsibilities as a Green Lantern. At one point, Hal is so crestfallen and said, "He (Tomar-Re) said the ring would have not chosen me if it hadn't seen something. But I don't see it." To this, Carol replied, "I see it. I always have. The ring did not see that you are fearless. It saw that you have the ability to over come fear. It saw that you are courageous. And you are, just like your dad." Wow! I really, really love every single bit of motivational elements in this movie! In summary, you really should disregard negative comments about this movie and give it a shot. It's definitely way better than BAYformers, I mean Transformers 3.